Are you on a well? Are you having trouble with your well pumps in Westchester County? We are your full-service well provider. The only thing we don’t do is dig, but we are connected to some of the best dig teams around. When it comes to the plumbing pieces of your well, though, we can diagnose, troubleshoot, repair, and install anything you need to make your well run just the way you’re used to. Do you need to know how much water is in your well? We have state-of-the-art sonar tools that let us check your water levels accurately and quickly. This will also let us know if we need to take action to get those levels where they need to be. Maybe one of your well pumps in Westchester County has stopped working, or isn’t working very well. We’ll figure out what has gone wrong and oversee whatever needs to be done to get it working again. Not sure if your well pump is having problems? Has your water pressure changed recently, or do you feel like you water is working differently than it used to? These are signs that it might be time to look at your well pump. 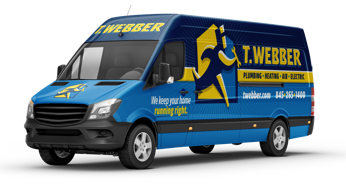 When you call T.Webber to service your well pumps in Westchester County, you’re calling a company that many people have trusted for years with all of their well-related needs. Let us show you why we are one of the top well service providers in Westchester County.